Recently I was doing a search online for a particular scale. As I was searching I came across a new scale that I had never seen before. It was a price computing scale that was being sold for an absolute ridiculous price. I looked it over and read the specifications and took a look at the product pictures. I couldn’t help but recall the last super low cost price computing scale that I had found. It was probably ten years ago and it was by far the cheapest scale on the market at that time. I bought one and tried it out and it seemed ok. Anyway, we sold a few of them here and there. They did ok but to be honest to this day it is the most failure prone retail scale we have ever used. We get calls requesting replacement parts for this scale to this day. This cheap scale that I just recently noticed also made me think of another scale that was the low cost scale of choice more recently. We sold a ton of this particular model and it was a good scale for the most part. Sure, it had a few failures from time to time. But mostly the failures were simple like a keypad, rechargeable battery, or AC adapter. All of which were pretty inexpensive. Our real downfall with this scale was the total lack of support that we received from the manufacturer. All they seemed to care about was “moving boxes”. I won’t go into great detail but it was one of the worst manufacturers we ever dealt with, and we basically deal with almost all of them. 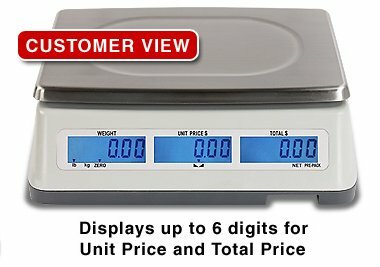 Can I Buy An American Made Digital Price Computing Scale? Just about every year we get asked by a potential customer, “where can I buy a digital price computing scale that is made in the USA?” There really aren’t many choices anymore. With the low cost products from China it is simply more efficient for U.S. scale manufacturers to contract out with a chinese company to build several hundred retail scales and then ship them over in a container on a boat. Almost every major scale company in the country does this. Generally, the scales are built pretty well and they weigh well enough to earn a CoC number and be deemed “legal for trade”. If you are looking to buy an American Made retail scale for your farmers market or candy shoppe then please take a look at the Detecto PC-30 retail scales. 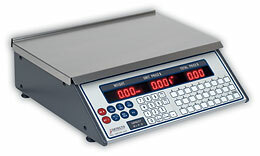 Detecto’s PC series feature a 0.56 inch bright red LED display on the front and back of the scale for weight, unit and total price as well as 99 programmable preset prices, and RS232 serial port for printer connection. Customized print options include “Packed on” and “Sell by” dates with removable PLU key label chart for identifying your specific products on the keyboard. A low profile, compact design, perfect for limited counter space in businesses such as delis, meat shops, candy counters, cheese shops or anywhere anything is sold by weight. The scale features an alpha keypad to name each product for printing on the labels. 6, 15 and 30 lb capacities available. The scale is NTEP legal-for-trade and is built to be a heavy duty scale to give you many years of service. To be honest in our opinion this is a scale that works best in a permanent solution. In other words we wouldn’t recommend buying this to carry to the market every week because it is heavier than a traditional low cost import computing scale. But if you have a retail shop or buffet that you’re looking to sell food by the pound, then this PC scale from Detecto might be a good choice for that application. Detecto Scale, an ISO-9001 certified scale manufacturer, markets a complete line of quality weighing products for the healthcare, food service and shipping and logistics industries. Detecto headquarters and factory are in Webb City, Missouri, USA with warehouses in Canada and England. Founded in 1900, Detecto Scale is the largest medical scale manufacturer in the United States. The family-owned and privately-held company employs a staff of 350 associates trained in manufacturing USA-made, high-quality weighing products. Detecto has been featured on the TV shows “How It’s Made” and “World’s Greatest!…” Detecto Scale provides a one-stop shop for all of your weighing needs with an extensive product line of scales and weighing systems for a multitude of different industries. Located in the heartland of America, Detecto brings you more than high-quality USA-made weighing products, the company also offers knowledgeable, courteous, and efficient phone and electronic media support staff who are ready to answer your questions and take your orders. Detecto’s customer service, technical support, and aftermarket parts departments are all located at the factory headquarters in Webb City, MO. The company offers software, hardware, and connectivity support directly from the factory. Your risk is eliminated when you own a Detecto scale, since you only have one call to make for new products and service support. When you buy from Detecto, you’re not just buying a high-quality USA-made product… you’re putting Americans to work.